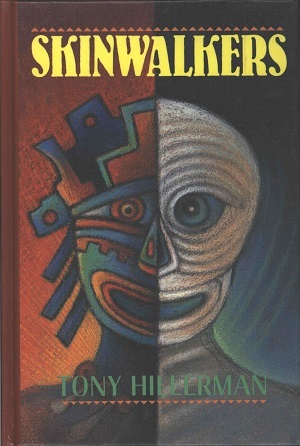 This is the first large print edition of Skinwalkers. This is the seventh book in Hillerman's Navajo Mystery Series and was published in 1984 by Thorndike Press in Thorndike, Maine. The cover was designed by Armen Kojoyian and features a illustration of a multicolored figure with two very different halves of its face. Binding: Multicolored boards with the author, title, and publisher's logo printed vertically on the spine.